Migrate this blog from it-from-inside.blogspot.com to blog.helgeklein.com. Migrate from Blogger to WordPress because Google is doing nothing with its Blogger acquisition, while WordPress is being developed very actively. The migration(s) should happen transparently to web surfers, and, even more importantly, in such a way that the existing Google PageRank is preserved. The latter requires a HTTP 301 redirect from each old URL to the correct new URL. In other words, if you or the Google bot try to access the old URL http://it-from-inside.blogspot.com/2010/03/how-to-enable-drag-and-drop-for.html the request should be transparently redirected to http://blog.helgeklein.com/2010/03/how-to-enable-drag-and-drop-for.html. Implementing 301 redirects is simple – if you have access to the .htaccess file on the webserver. Unfortunately, we do not have that on Blogger. 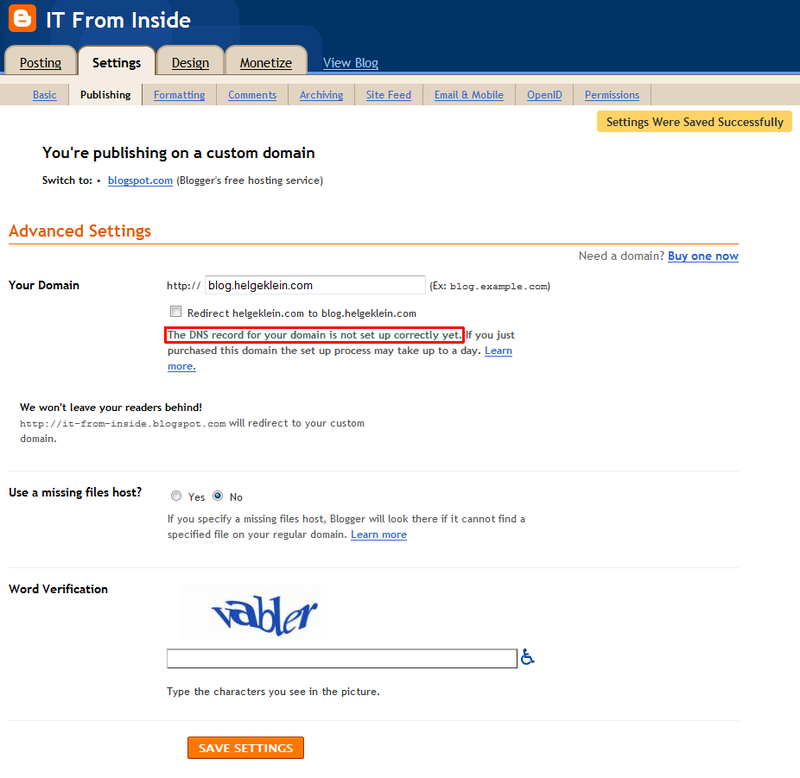 However, Blogger redirects on its own if you configure a custom domain. With that, migrations should be trivial – or so I thought. I exported my Blogger blog to an XML file and imported that into WordPress – easy. Then I pointed my custom domain’s DNS record at WordPress by adding a CNAME for blog.helgeklein.com pointing to helgeklein.wordpress.com. Now my Blogger content was accessible via the new domain blog.helgeklein.com. Only one thing left: tell Blogger to redirect from it-from-inside.blogspot.com to blog.helgeklein.com. The important thing is that Blogger says “The DNS record for your domain is not set up correctly yet”. That means that Blogger actively checks if the CNAME DNS record points to Google’s servers (to ghs.google.com, to be exact). If not, as in my case, where it points to helgeklein.wordpress.com, Blogger complains. That would not have bothered me, but as a consequence, Blogger does not 301 redirect but displays a page asking the surfer whether to redirect to the new site or not. That is not only not very friendly to my visitors, it also tells the search engines nothing about the change in domain name, making it impossible to transfer the PageRank. First, migrate from the blogspot domain to my custom domain using Blogger’s built-in mechanisms for 301 redirection. PageRank is preserved and visitors are transparently redirected to the new domain while the actual content is still served unchanged from Blogger. Second, let it settle down for a month or two. Give search engines time to update their indexes and associate the existing content with the new domain. Third, migrate the content from Blogger to WordPress. Today I am at step two. In a few months we will see how all this worked out. How did that worked out finally? Derek,I have not moved forward since posting the blog article.What can I say? Page rank seems to have suffered from the switch to a custom domain.